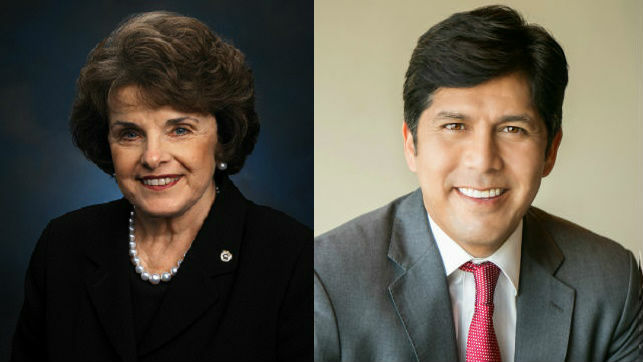 With an email and video claiming credit for infusing progressive politics into California’s Legislature, Senate Leader Kevin de Leon Sunday announced he will challenge fellow Democrat Sen. Dianne Feinstein as she runs again next year. De Leon, 50, would be the first Southern Californian to sit in the Senate in a generation, should he defeat Feinstein, who at age 84 is approaching the end of her fourth six-year term. De Leon, who represent’s the 24th Senate District in Los Angeles, is seeking to outflank Feinstein from the left, as she has positioned herself as a centrist. But some more progressive Democrats have noted her skepticism about single-payer health care proposals, and her track record of support for some of President Donald Trump’s policies and nominees. A Silicon Valley billionaire, Tom Steyer, issued a statement indicating he, too, might try to unseat Feinstein. Feinstein raised hackles at a speech last summer, when she said in a speech that opponents should give Trump “patience” and said he could be a good president if he had the ability to learn and change. That speech earned boos from the normally sedate Commonwealth Club audience. De Leon sent out email announcements Sunday, and the Sacramento Bee reported he would make a formal kickoff speech Wednesday at the Los Angeles Trade Technical College campus, downtown. In his email, De Leon said his legislative record “infused progressive California values in important policy efforts like immigration, women’s rights, quality education, civil rights, job creation and fighting climate change. Feinstein tweeted last Monday she would seek another term. The Los Angeles Times said Feinstein is one of the most-powerful senators, with the the institutional power of seniority and the personal wealth to self-fund a statewide campaign, even in the most-expensive campaign state in the country. On the Republican side, no strong contenders have emerged in California, regarded as among the “bluest” Democratic strongholds. Under Proposition 14, passed in 2010, California has a “top-two primary,” meaning the two candidates with the most votes from any party will advance from the primary to the general election in 2018. That raises the possibility of Feinstein and De Leon facing each other twice next year. Should De Leon win, he would be the first Southern Californian elected to the Senate since San Diego’s Pete Wilson won in 1982. Former State Sen. John F. Seymour was appointed to the Senate when Wilson was elected governor in 1990, but defeated when Feinstein won a special election for the seat in 1992. Feinstein is a former San Francisco mayor, and the other California senator, Kamala Harris, also is from the Bay Area. Harris replaced Sen. Barbara Boxer, another politician who came up in Northern California’s Marin County, although she moved to the Coachella Valley in her last Senate term.